I’ve found a new favorite. One of those staple patterns that fit just right with no alterations or modifications. Rare. 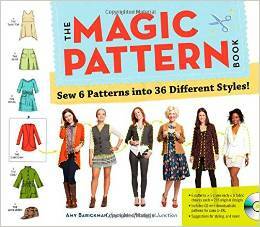 I recently came across the Magic Pattern Book at my local bookstore and thought it was a great idea- 6 patterns that can be adapted to 36 different looks. I was a bit skeptical about how it would work, or how the sizing would be given I had never heard of it before nor had I read any reviews online so I decided not to buy it. I got home and checked Amazon, read the reviews and bought it right away. Isn’t Amazon Prime the best thing ever? I only had to wait a few days before getting it and started right away on the first pattern- the Alice Tank. I really loved the lines of the tank, the flowy sides but the structure of the bust darts and more fitted top. 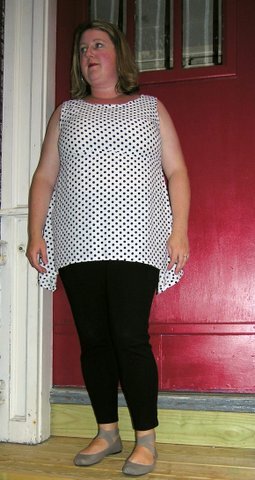 Bonus- the patterns go up to an XXL so it fits all sorts of body types and it is long enough to pair with leggings or skinny jeans. I am so proud of myself to take a chance on a book and pattern not really discussed online- I always look to Pinterest or blogs for inspiration but I can’t really find anything out there on this book yet. I feel like I am pushing this- but seriously I don’t have sponsors or anything- this is totally unsolicited. 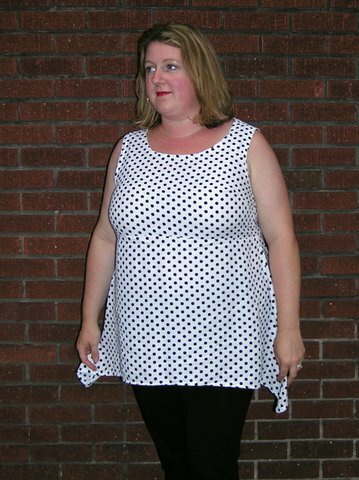 I followed the pattern to a t- except I did not include the optional back elastic- I didn’t think that there would be enough space for the chest area if I pulled in the back…and I was right- without any modifications this fit me perfectly. I even went on to make 2 more. woo hoo! The fabric was a mystery fabric I purchased at Savers…I can’t believe I found a thrift shop that sells fabric. Score. This probably cost $2 to make. Even though I just made this last weekend (in one hour before heading out wine tasting! ), I’ve already worn it twice. Love. These aren’t the best pictures, but given that I just went back to work yesterday I am a bit overwhelmed with the semester starting, school right around the corner- I am lucky to find the energy to sew!